The Solaris Project is a nine-piece collaboration of seeker-songwriters on a mission of musical inspiration. 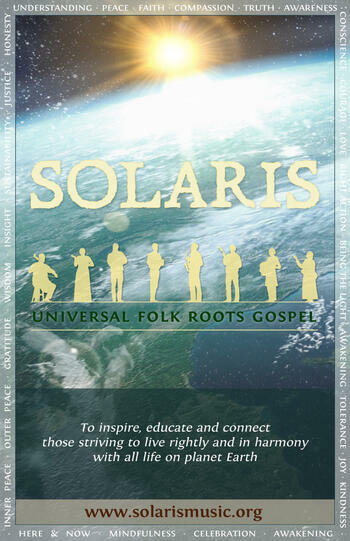 With a repertoire of honest and uplifting original songs accompanied by multi-part vocal harmonies, guitar, keyboard, ukulele, accordion, fiddles, horns, mandolin, drums, bass, banjo, and more, Solaris delivers an inspiring musical message of awareness, responsibility, and empowerment for positive change. The band is wrapping up a three-month tour of the Western US, which included concerts at the international Parliament of the World's Religions in Salt Lake City and the Peace in the Park festival in San Francisco, among many other venues.